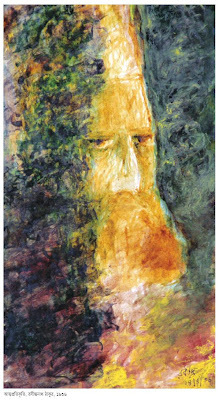 কিন্তু রবীন্দ্রনাথ ঠাকুরের আঁকা এই আত্ম-প্রতিকৃতি, এটা দেখে আমি আক্ষরিকার্থেই মুগ্ধ! অসাধারণ! Halsman set up his New York studio and using the 4 x 5 format, twin-lens reflex camera that he had designed in 1947, he prepared to capture one of his most memorable photographs. 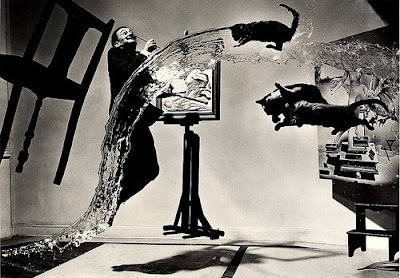 He suspended an easel, two paintings by Dali (one of which was “Leda Atomica”), and a stepping stool; had his wife, Yvonne, hold a chair in the air; on the count of three, his assistants threw three cats and a bucket of water into the air; and on the count of four, Dali jumped and Halsman snapped the picture. While his assistants mopped the floor and consoled the cats, Halsman went to the darkroom, developed the film, and reemerged to do it again. “Six hours and twenty-eight throws later, the result satisfied my striving for perfection,” wrote Halsman.